Em's Knitty Corner: Yarn shopping! Ok, I went shopping today, and of course I bought way to many yarn! You have to keep in mind that we don't have much designer yarns like Lorna's Laces and all over here. 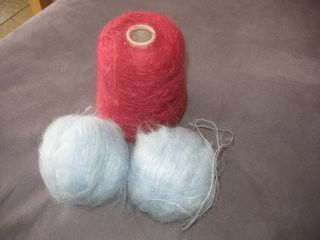 It's even hard to find pure wool yarns, especially those that don't felt. I think that over 90% of the yarns sold over here have some amount of acrylic in it. 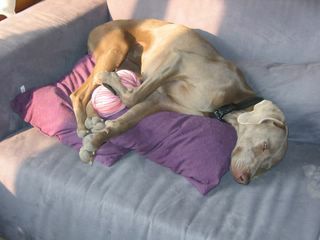 The LYS I go to used to be huge in the Benelux, they sold the best yarn around. Now the lady running it has 2 yarn stores and works for big couturiers in France. 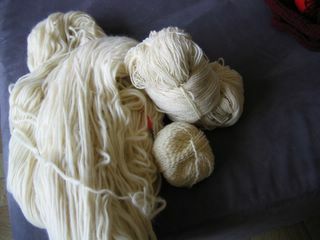 The last job allows her to have really high quality yarns in her shop, stuff you can't get anywhere else. So everytime I go there I find a ton of stuff I haven't seen yet. And every time I see other things I like, and since the second time I went there she keeps saying "Oh, if you want that, I'll give you a special price", and she always does! So I end up buying to much stuff. I have a huge stash already just because of her! I swear, I don't think I'll ever knit this all. So, let's start. I bought this huge bag of pure nature wool yarn. She kept giving me special deals on stuff, so I couldn't resist. The yarn on the upper right is Norwegian yarn, so very high quality. She won't have it anymore (though I'm sure she'll have other stuff) so I had to buy very much! :D All this yarn is to dye and felt or just knit. I bought the first cone like this last time I went there. 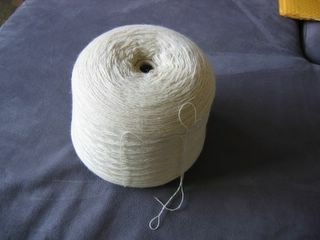 It's lace weight yarn and I'll probably use it either for lace or for socks (I'm thinking a ton of socks!). 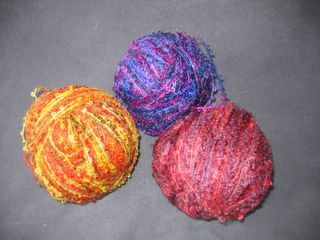 Both cones are huges so I sure have plenty to dye and knit! Oh, and it's pure wool, of course! The lady will be looking for more of these cones, or at least more sock yarn. Probably on cones! Very special, she only had it for about a week and it was almost sold out. She told me what it was (one of those famous couturiers, don't remember which one). The colourse are better in reality, some pink, grey and light brown. Not sure yet what this will become. A scarf or a shawl. Loopy mohair. Showed this before. I bought more. The yellow/orange is going to be a scarf for my mom. The pink/purple in the right bottom cornor was a new colour she had it, totally my colour! I'm in love with it! Lace scarfs or shawls I'm thinking! Pure mohair, really fine and fluffy. I already have black and might call her soon to keep me a cone of black as I'm so in love with black and will always be able to use this. This is also the last she's having so I can't afford not to buy it! 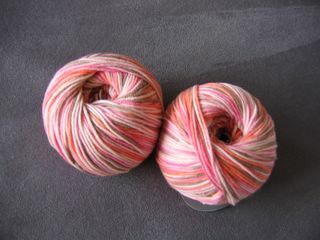 And then last, but not least (though no nature stuff this is), a cotton/acrylic blend for a Summer top I want to knit. I had forgotten the magazine the thing was in but of course she had bought it as well. She advized me this. I wanted pure cotton but she said pure cotton was so hard to get. The yarn suggested in the book was ... oh damn, I don't remember. Oh well, I'll let you know later. I'll start this one soon, as it should be done for the Summer. I'm off to knit some more on my socks. I'm so happy with them! 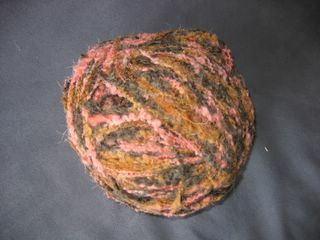 I will have to start dyein yarn soon though! Oh, and I got my yarn from PippiKneeSocks today as well, I LOVE it!! !